As projects get bigger, you probably start organizing them items into folders. This makes keeping track of your project easier but it can also make some things more difficult to find. For example, when you are examining a canvas subclass, a container control or a webdialog on a layout and need to look at the original project item digging through your project to find it can be time-consuming. Fortunately, there's an easier way. 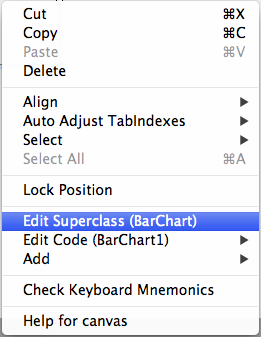 Just right-click on the item on the layout (or in the tray in the case of web dialogs) and choose "Edit Super Class" from the contextual menu. This will take you right to the parent item which is its super class. If you haven't spent much time investigating the various contextual menus, it's worth the effort. There are several great shortcuts in them. This is fine until you using NameSpaces. Then this method fails. Same thing with AutoComplete on NameSpace objects/methods. Hopefully this will be much better in the new IDE. Seriously, the current implementation is flawed for NameSpaces. That's nice, thanks for posting. However, the Apple HIG state there should be no contextual menu commands that are not also available from elsewhere (like in the menu bar). And, this time, I tend to agree with them: a contextual menu isn't the first place where I look for commands, it's more the place where I expect to have shortcuts for things I was doing slower until then.